In the earlier section, we mentioned the carbon compounds methane, ethane and propane, containing respectively 1, 2 and 3 carbon atoms. Such ‘chains’ of carbon atoms can contain tens of carbon atoms. The names and structures of six of these are given in Table 4.2. We see that both these structures have the same formula C4H10. Such compounds with identical molecular formula but different structures are called structural isomers. 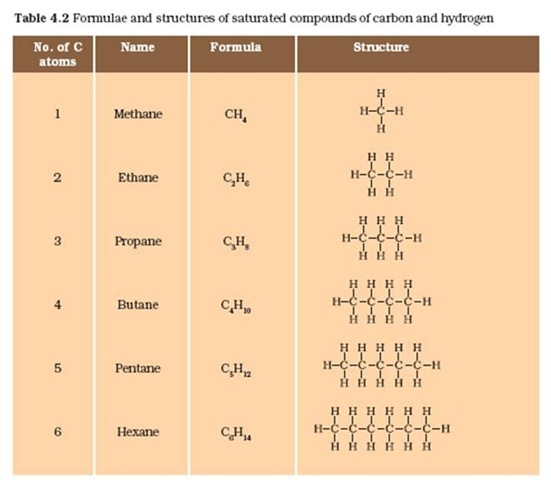 All these carbon compounds which contain just carbon and hydrogen are called hydrocarbons. Among these, the saturated hydrocarbons are called alkanes. The unsaturated hydrocarbons which contain one or more double bonds are called alkenes. Those containing one or more triple bonds are called alkynes.